My children's school celebrates Teacher Appreciation Week this week. It's a wonderful opportunity to show our great teachers how much we thank them for all they do for our children. I purchased this flower pot from Etsy and filled it with gift cards and scratch off lottery tickets. I cut the floral foam to size and placed it into the bottom of the pot. Next, I cut out some flowers from craft foam and hot glued them to the skewer sticks. I then stuck the skewer sticks into the foam and added the gift cards to the fronts of the flowers. Finally, I topped it off by adding some artificial grass. 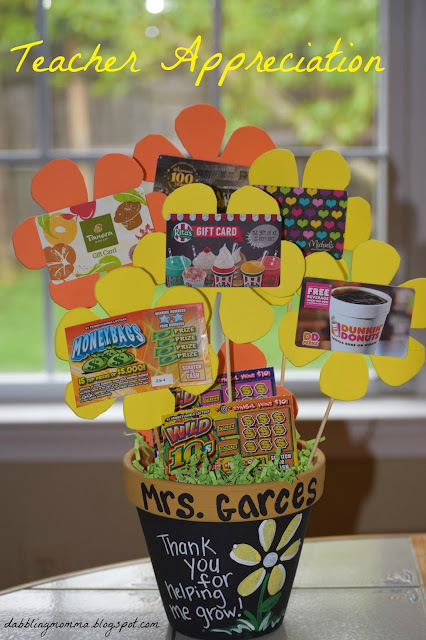 My hope was to give my child's teacher a gift that she would be able to enjoy now; the gift cards and then the flower pot, hopefully something she'll be able to use for years to come. Know though that showing your child's teacher appreciation doesn't have to cost alot or anything at all. In addition to the flower pot I helped the children learn a quick and easy song to sing to their teacher. I think the song was the real winner! !